~The Art of Life~: Ice! ~~We woke up to a cold, wet winter wonderland. We're in the middle of an ice storm. Ice is fascinating to look at, but I know it can cause a lot of damage. There was no school today. It's the second day that we've been house-bound. The girls are handling it okay, although Savannah cried and cried this morning when I wouldn't let her play outside! My poor Dustin had to brave his way to work. First he had to scrape the car out of its ice tomb! He said it was literally like a thick shell. Thankfully we still have power. Thousands in the state are without it. I don't mind being stuck in as long as I have electricity and heat! The lights flickered a bit this morning so I'm keeping my fingers crossed! Poor Savannah. I'm itching to get out of the house too :) Travis had to work all night long, because of all the damage done to the power lines. Uuuuu. 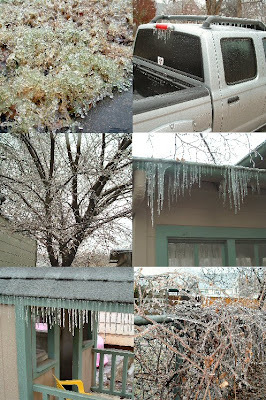 We have ice storms here, too. But usually a couple of days only. So neat to see but dangerous and hard on the people that have to work. We have to put on golf spikes to go get the mail. :) Yesterday was 77 and today is 46, go figure! I hope you stay warm and cozy and all goes well. I just wanted to say thanks for stopping by my blog last month and for posting your list of things you're thankful for. I love your heart and your list! I got a little behind on my blog so I'm catching up on the contest entries right now and hopefully drawing the winner later today! Bless you and have a merry Christmas in Christ! Wow that is a lot of ice! You captured some great pictures!! :) That one on the top left has very interesting texture and beautiful green colors. Be careful in that cold weather!